rotary actuator, designed to provide the valve disc with a rotating action. The necessary power to perform the required stroke is given by a dedicated Hydraulic Power Unit, carefully designed for a safe and reliable service. The rotary actuator mechanical drive section is a device which actually provides the valve disc with its rotation inside the valve, allowing the valve functionality. It holds both hydraulic and mechanical features and can be considered as a multi-type redundant device. During normal operation, the mechanical drive section works in hydraulic mode; the Hydraulic Pistons receive high pressure oil form the Hydraulic Power Control Unit and start moving thanks to the hydraulic power supply; this movement makes the disc rotate and allows the valve operation. 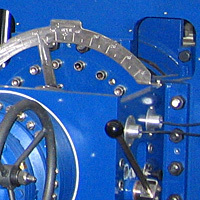 The first type of redundancy is still in hydraulic mode; the HPCU is able to work by using a redundant battery of accumulators (standby accumulators) that are usually sized to allow the actuator two full strokes; in this condition the actuator can still regulate the disc position, even without electric power supply. The second type of redundancy is in mechanical mode; the actuator can be switched to manual operation and then operated both by the hand-wheel or by an air motor (optional). Hydraulic cylinders are provided with hydraulic cushions, to allow a smooth contact between disc and valve seat in closing direction. Cushions can be adjusted according to the necessity, in order to have always an high performance brake effect. The position transmitter is also redundant to provide both the Local Panel and the DCS with a reliable information. The selected primary transmitter provides the position control signal to be used by PLC in a position control loop (P-amplifier/controller); in case of failure of the primary transmitter, the PLC automatically switches to the secondary one, still keeping the system in operation. A switch to select either one of the two position transmitter is provided. In hydraulic mode the double effect cylinders receive high pressurized oil from its inlet ports (C1 or C2), while the outlet ports allow the oil discharge from the other side of each cylinder. The differential pressure, between the two hydraulic cylinder cameras, generates the thrust required to move a valve disc. In order to work in mechanical mode every hydraulic function needs to be disabled; it is also necessary to manually engage this mode in order to avoid any possibilities of hydraulic and mechanical contemporary use. The system engagement is obtained by pulling up and down the engaging lever; once engaged, the coupling is able to apply a torque due to the hand-wheel rotation straight to the valve shaft. Once engaged the mechanical drive, the field operator can decide wether to use the manual drive or the air motor. The air motor drive has to be preferred due to the reduced operating (closing or opening) time. Neverteless, the manual drive allows the field operator to manouver the actuator by a rotation of the actuator handwheel. In addition, the air motor is selected according to the available instrumental air supply. The worm gear-motor will run in lubricant medium and will be sealed by Viton® type material seals. Hand-wheel engagement alarm in parallel redundant configuration, with two lever-less magnetic sensors, both without moving cables and linking devices. In case of failure of one sensor, the PLC sends a message of Hand-wheel Engagement Sensor Failure, both to local panel and to DCS. In case of hand-wheel engagement, the PLC not only sends a message of Hand-wheel Engagement (both to local panel and to DCS, again), but it also isolates the servo-valve from the main hydraulic circuit (lock in position status). In this way, it is not possible to operate the valve in automatic mode when the hand-wheel is engaged, avoiding possible actuator failures. These actions bend and compress the case. In addition, due to the high rotating speed, the mechanical drive section case has also been checked against dynamic actions with a finite element analysis, performed with NE-Nastran solver, pre and post-processed by Femap. Remosa s.r.l. – società con socio unico soggetta alla direzione ed al coordinamento di IMI p.l.c. Sede legale: Viale Pula 37 - 09123 Cagliari, Italy | Capitale sociale: € 2.087.602,40 i.v.